In Indonesia, many brands and types of oil was widely circulated. Each product offers the advantages of each. However, for consumers, to choose the right and suitable oil for your car would be an important thing. One thing you should know is expensive oil is not necessarily good for your car. 1. The first thing you notice is the engine specification. You should read the manual first in the instructions for use and maintenance of your car. In the book, you will definitely find the user manual of oil and type of oil which is suitable for your car. 2. Try to pay attention to the level of the oil viscosity. For Toyota cars today have used VVT engine, VVTi or the like, you should use an oil that has a viscosity of 10/40 or 5/30. It is very important to note. Never use an oil with a viscosity of 20/50 as an oil of this type is not suitable for cars with VVT specification, or VVTi. 3. Note the API code in the oil, for the latest cars. Cars that use a new technology will usually provide clues to control sediment and high temperatures will be much better. However, for a production car in 2004 and earlier, you should use oil with SL code. 4. At certain times such as winter, you can also use oil with code W, which means winter. You can find it on certain brands, such as the SAE 15W-50. This code indicates that the car could have SAE viscosity level at 15 degrees for cold temperatures, and 50 degrees for heat. 5. 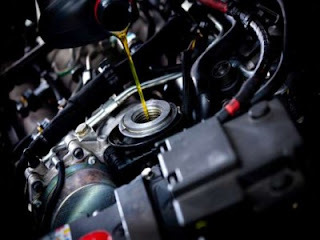 For cars that use the latest technologies such as turbo, super changer, DOHC or so, you should use synthetic oil. Latest technology machines will require better lubrication. 6. Some of you may be advised not to change the brand of oil. You are actually allowed to change the brand of oil. Only, you must ensure that you keep using the same oil viscosity level. 7. You should not add volume, or do to up the volume of oil for your engine. It is actually not good because there will be a residue that should be thrown in your old oil.